We owe a debt of gratitude to all members of our armed forces. We owe a special level of respect to foreign-born members of the military that fight for the United States even before enjoying the benefits of citizenship. 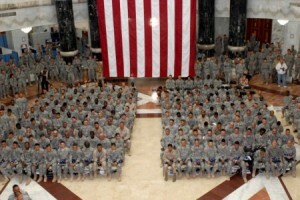 Expedited citizenship through military service is one way to show that appreciation. For their sacrifices, U.S. military service members do enjoy some benefits when it comes to naturalization. While most naturalization applicants need five years as a permanent resident, military personnel can obtain U.S. citizenship much more quickly. Even the USCIS filing fee is waived. While most naturalization applicants need five years as a permanent resident (or three years if sponsored by U.S. citizen spouse), military personnel can file for naturalization without the continuous residence requirement. The requirement to reside in the U.S. state in which the application for naturalization is filed for at least three months is also waived. What is the continuous residence requirement? While most naturalization applicants are required to be physically present in the U.S. for 30 months (18 months if sponsored by U.S. citizen spouse), military personnel can avoid this requirement through their service. What is the physical presence requirement? Naturalization will cost most civilian permanent residents $725 ($640 USCIS filing fee + $85 biometrics appointment fee). The filing fee is waived for military service members – only $85 for the biometrics is required to file the application for naturalization. However, some service members’ naturalization can be further expedited (under section 329 of the INA) if serving in periods of hostility. The applicant must have served honorably in active-duty status, or as a member of the Selected Reserve of the Ready Reserve, for any amount of time (even one day) during a designated period of hostilities and, if separated from the U.S. armed forces, have been separated honorably. We are currently in a designated period of hostility (September 11, 2001 – present) that will terminate when the President issues an Executive Order terminating the period. For additional information on expedited citizenship through military service, visit our section for Immigrants in the Military or see the USCIS website’s section for Citizenship for Military Members. Spouses of U.S. citizen members of the U.S. armed forces may be eligible for expedited or overseas naturalization. And children of service members may be eligible for overseas naturalization. Learn more about citizenship for family members of military personnel. For more information about naturalization for family members, see the USCIS website’s section on Citizenship for Spouses and Children of Military Members. 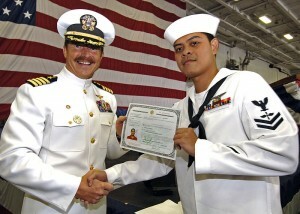 A basic requirement for enlistment in the U.S. military is having a valid and lawful immigration status. Generally, armed forces require enlistees to be U.S. citizens, U.S. nationals, or lawful permanent residents (green card holders). Currently undocumented immigrants are not permitted to serve. But exceptions have been made for the MAVNI program — Military Accessions Vital to the National Interest. MAVNI is a special recruiting program that has allowed certain undocumented immigrants to join the U.S. military. It is an extremely selective program that recruits people with specialized healthcare experience and/or desired language skills. Some military installations have a designated USCIS liaison to help service members with the application process. Ask your chain of command for the contact information for this person. USCIS also provides customer service specialists that can respond to inquiries from military service members. Service member and families can reach USCIS through a toll-free telephone help line 1-877-CIS-4MIL (1-877-247-4645) or via email at militaryinfo.nsc@dhs.gov. CitizenPath provides step-by-step online assistance for U.S. military members applying for citizenship. Created by immigration attorneys, the online service makes it simple to prepare USCIS forms, including N-400, Application for Naturalization for overseas applicants. Designed by attorneys, CitizenPath is the online service that makes immigration forms simple. The website provides simple, step-by-step guidance through USCIS applications and petitions. The low-cost service helps to simplify the process by explaining each question and providing alerts if your answer to a question could be a problem. Most people do not need a lawyer to prepare USCIS forms, but many need a little assistance. That’s where CitizenPath can help. CitizenPath provides support for the Citizenship Application (Form N-400), Green Card Renewal (Form I-90), and several other USCIS forms.